Now is the time of year when your over-wintered, potted mint plants will be waking up and starting to put on new growth. That means it’s a great time to check your plants for winter damage, re-pot them in fresh compost, and take stem cuttings for propagation in the process. Here’s a quick example of one I propagated the other day: a 9cm potted black peppermint (Mentha x piperita vulgaris) plant that I bought last year (at the RHS Chatsworth show, if I remember correctly), it was still a relatively small specimen when it entered its winter dormancy period. This is perfectly normal for mint plants grown in pots, as they should be if you don’t want them to take over huge swathes of your borders, lawns and anywhere else they can reach. This is because propagate freely by runners (technically stolons) – horizontal stems growing outwards from the main plant – which then put down further roots and develop vertical stems, leaves and flowers. 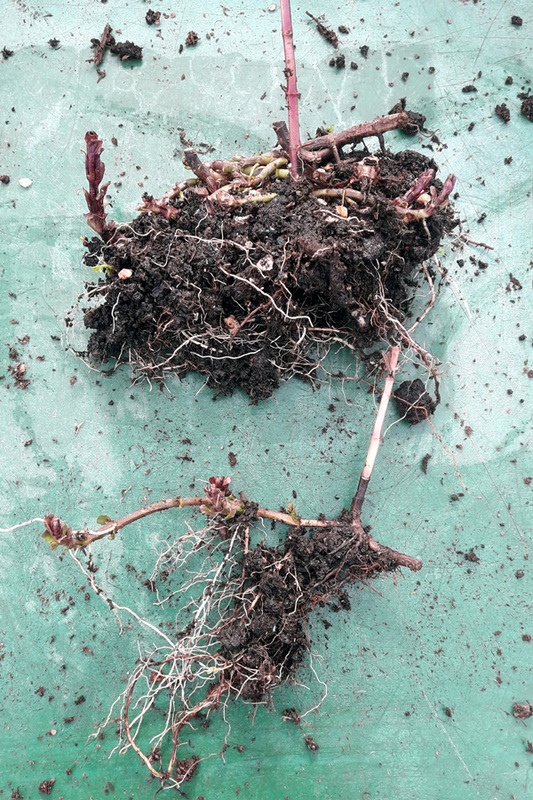 The original centre of the plant can sometimes die back as the energy goes into the new growth. 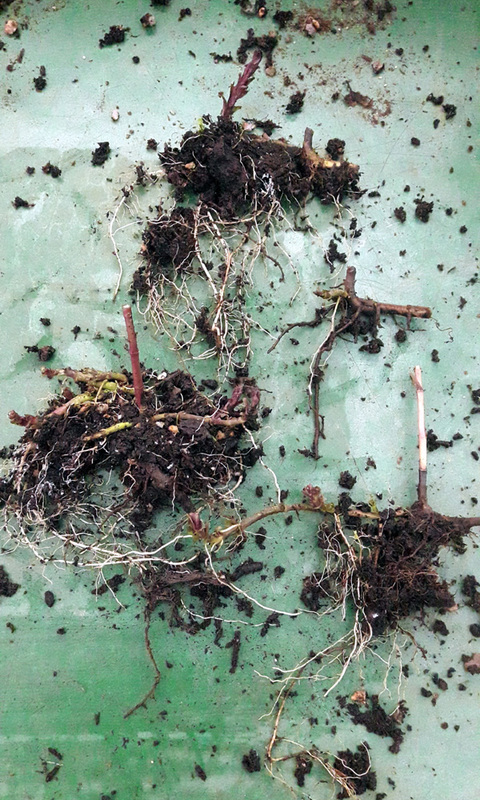 In fact, after a bit of further snipping, I ended up with a total of five small plantlets that were already exhibiting root growth and vertical stem growth, plus another three good horizontal stem-cuttings that should root themselves without too much trouble. That’s a total of eight plants for the price of one. 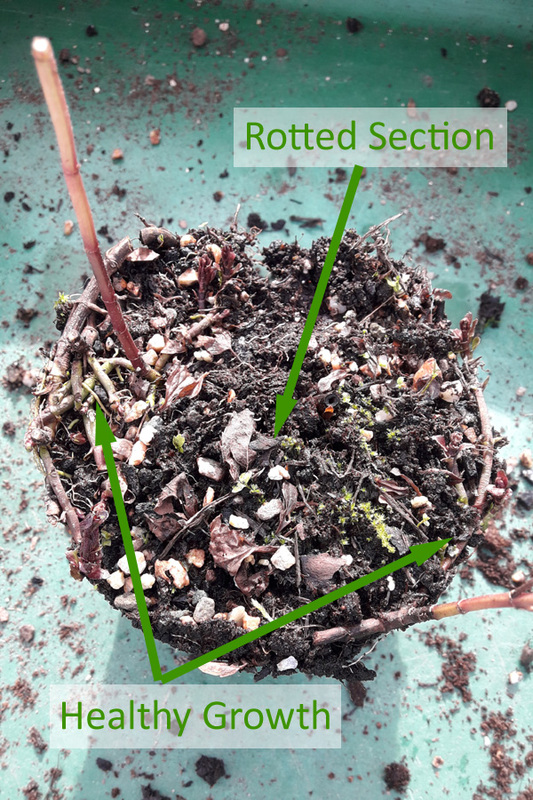 They were potted up into small containers of gritty compost – to aid drainage – and covered in a thin layer of fine grit as well, to help retain moisture and hopefully prevent weed seeds from gaining a foothold. I’ll grow the new plants on in a semi-shady area, pot them on as required and within a couple of years they’ll hopefully be supplying me with handfuls of black peppermint leaves for my favourite variety of fresh mint tea. How about you? 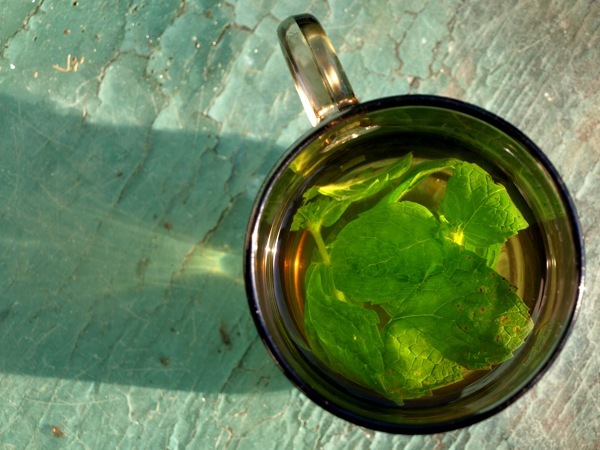 Have you divided your mint plants yet? Do you have any top tips for success with mint cuttings, or any other sort of cuttings? Please do let me know, via the comments.